Who else would like a proven blueprint with a 95% success rate that has turned over 750 brand new personal trainers into successful PT inside 10 week? 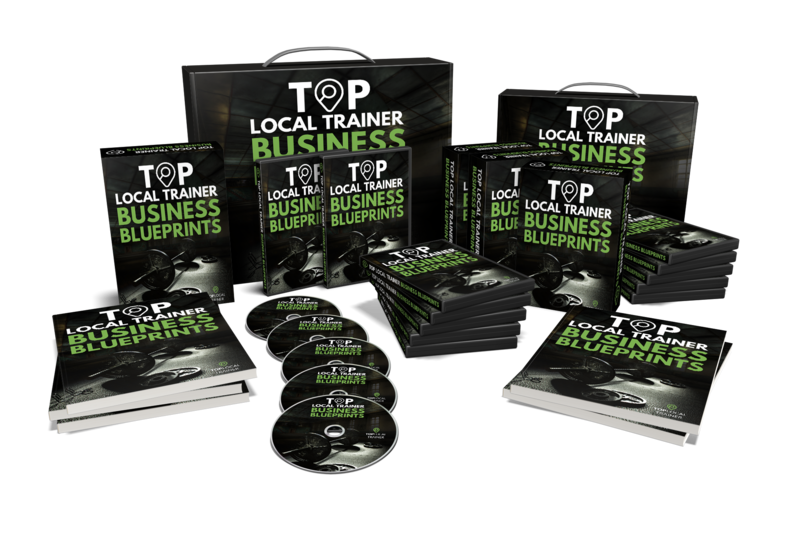 Would you like a Business Blueprint that walks you through a step by step process on how to get clients as a PT without spending a penny on advertising? How about I also give you fully comprehensive guarantee, if you don’t make at least 10 times your investment with this blueprint i’ll refund you every penny. Already got a TLT profile? your personal training business without having to spend years studying sales? If you work with me you are 95% guaranteed to succeed as a personal trainer. So far, I've helped over 750 PTs as a national manager for the biggest personal training management company in the UK. And currently manage and mentor 267 PTs a month. But only 95 out of 100 succeed. The ones that it doesn’t work out...well…they couldn't follow simple instructions and take action. Or personal training just wasn’t for them. They're happier in a typical office job. Stuck behind a computer for 40+ hours a week. And that’s okay. Not everyone is cut out to work for themselves. It takes a special person to improve the lives of their clients, and to take action toward a sustainable, consistent, predictable income as a trainer. Is that you? You've been left out in the cold on your own trying to figure out how to make a living with no-one helping you? You're tired of fighting for scraps with all the other PTs and have no idea on how to get clients? The thought of approaching strangers at the gym and selling them makes you want to go and hide in a dark cupboard? The solution genuinely is straight forward, simple, and, dare I say it - it's easy. You’re FLAT OUT WRONG if you think you need to be a pushy, salesmen to be a successful PT. You DON’T need to be an outgoing, people person. You absolutely DO NOT need to be a pushy sales douche! You DON’T need to be an experienced business person or personal trainer. This ISN’T about waking up at 4am and spending 15 hours a day hassling people left right and centre until someone finally gives in and pays you. You DON’T have to get your kit off, post all over social media daily and enter figure model competitions (unless you fancy it). The truth is that every week I watch brand new beginner PTs go from absolutely useless at getting clients with zero sales skills. To getting clients with absolute ease. My speciality is working with those brand new to the industry (even if you're straight out of you PT course). In fact, it’s often better as you have less bad habits to be hammered out of you! The secret to converting half your complimentary sessions into paying clients without being a pushy salesmen. The biggest obstacle… (that you have no idea is in your way)… stopping you from becoming a high earning, successful personal trainer. How to generate a constant flood of new leads in a fun, easy way without spending all your cash. How to make it nearly IMPOSSIBLE for someone to not take you up on your services. A full ‘say the words, get the money’ sales script for every step of the client getting process that is repeatable over and over. How to ONLY work with the kind of clients you like to, that love and respect you and your time and are happy to pay bucket loads for it! What you must do right before any complimentary session you give to guarantee they turn up and don’t waste your time. PLUS how to get your leads to buy almost anything from you using a sneaky trick that positions you in their mind as an undeniable expert. I have made a very successful career out of taking just about any ‘fresh of the streets’ new PT, with little to no talent and… turning them into a successful personal trainer in less than 10 weeks. Imagine how you’ll feel when you know exactly how to convince people to become your clients and put money in your pockets like clock-work month after month. Having gone from a total failure as a PT to having full client list. Trust me, it’s one of the best feelings in the world! Here’s exactly what you get with the TLT Business Blueprint program. You get my full resources at your disposal. I hold nothing back and give you EVERY technique and strategy you need. Getting you to exactly where you want to go – financially and in terms of lifestyle. Seriously...every resource and bit of knowledge I’ve acquired over the last 8 years as a very highly paid personal trainer AND everything I’ve learned teaching over 750 personal trainers how to sell and become a successful PT is YOURS. So you have complete confidence and certainty you will succeed. I’ll tell you exactly what you need to do, every step of the way. And you can ask me absolutely anything. Whatever obstacles you’re facing, I’ve seen it before and know EXACTLY how to fix the problem quickly and easily. A 10 week step by step Mobile business blueprint walking you through the day by day tasks you should be doing. A 10 week step by step Gym Based business blueprint walking you through the day by day tasks you should be doing. Who is your ideal customer and how to target them. How to find and target them. Setting up and optimising your social media accounts. Our partners “SocialMediaCrew” will take you through a step by step process on how to set up business accounts. Setting up google accounts and forms to capture more enquiries. How to create simple forms. How and what you should be posting on social media every day and week to attract your ideal customers. A weekly guide on how and what to post. Where to post and when. How to run online challenges. What a challenge is and why you should run them. How to setup and run a challenge. The different options of challenges you can run. How to run online trial to attract customers. What is a trial and its benefits. How to set up and run a trial. How to get clients through a trial. How to use Weekly debriefs and keep your clients for longer. What weekly questions you should be asking clients and why. The benefits of a weekly debrief and how it can be used to retain and motivate clients. How to find the right clients online and offline in your local area. What the term “Go Fish” means. How to Go Fish for new business. How to get referrals from clients. The process of asking clients to refer you to friends and family. Why you should ask them for referrals. What they should be posting on social media. Setting up a reward scheme for them. How and Why you should run a Complimentary Session. 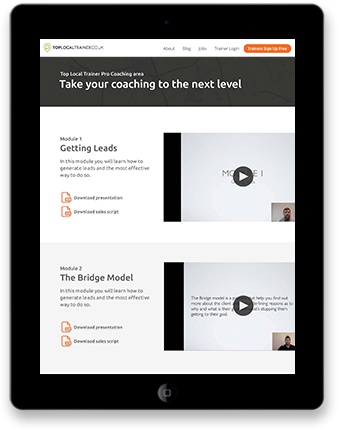 I’ll show you EXACTLY how to use The Bridge Model during a complimentary session. The exact ‘sales script’ of precisely what to say and do and when during each stage of a complementary session. What to do if they say no to your services and sway them into becoming a client – converting up to 50% of your complimentary sessions into paying clients. How to still make money out of complementary sessions even if they don’t take you up on personal training. The Bridge - the process to get the clients to understand how working with you will get them to their goal. One of my most powerful weapons to get to know what makes a complete stranger tick deep-down in a matter of minutes. Find their true fitness goal – (Hint: it’s NEVER what they tell you first time around). Find their drivers – These are the ‘buzz’ words that have extreme power over them. Use them at the right time and you’ll have them more excited than a puppy going for walkies! Find their deep emotional barriers – ever have a client or lead just weirdly not do what they said they would? This is where you figure out exactly what this person will do to sabotage their progress and how to avoid it. The 3 yes’s – a sneaky mind trick to have the client eating out of your hand and ready to do whatever you tell them. The prescription – a powerful shift that allows you to convert 50% of your complimentary sessions into clients effortlessly. You don’t have to ‘sell’. You don’t have to be pushy. It’s like being a doctor in a lab coat they just do what you prescribe because they know and trust you as their expert fitness consultant. I always give a strong warning. You HAVE to use this stuff for good and only offer your clients what is truly in their best interests. It’s so powerful you could convince people to buy all kinds of junk from you, which is why I will only work with good, people with morals (more on that later). The ‘Ice Cream Flavours’ strategy – how to make money out of 75% of the complementary sessions you give. How to increase your income when you’ve already got as many PT clients as you can handle. Make more money without putting in more hours. How to add an extra £6,000 to £26,000 of ADDITIONAL income on top of your 1-2-1 personal training sessions. All the content is available at anytime for you to re-watch and pick out new details from or find things to ask me about in our weekly calls. You have zero business, sales and personal training experience. Got fired from a ton of other jobs. Hell even if Mcdonalds wouldn’t have you – I’ve turned people like you into rip roaring successes. All im looking for is for you to take action and really want to be a successful personal trainer and make a difference to your clients. I know exactly what it’s like being a brand new, terrified PT. I know that there are way more bills than there is income. You have to think way too hard about every penny you spend. And the thought of something you buy not working out can be crippling. It’s not a fun time, I’ve been there and I’ve coached countless PTs through it. I don’t want that feeling to stand in your way. Because if that is really you, you’re the person I really want to work with. In my experience, the PTs who are most DESPERATE mostly get the best results. They’re hungrier, more ready to do whatever it takes. So I don’t want money to be the thing holding you back. I flat out guarantee that if you don’t make at least 10 times more money than you invest in the Mobile Business Blueprint I will refund you every penny. I know my numbers. I know that 95 out of 100 personal trainers I work with succeed massively. So I know you’ll succeed. But, like I said, I don’t want money worries to hold you back. So I’ve got you covered on this. I’m your insurance. I’ll make you succeed or it costs you nothing. Not the decisive type? Still not sure? You need to think about what you LOSE if you don’t sign up. I know ALL the big players in the PT industry. There are honestly only a very small handful of people that have the experience training and succeeding with so many personal trainers that I do. You KNOW the importance of a structured plan (just like you offer to your clients). You KNOW you need the right plan (just like you create plans for your clients!). If you let this opportunity slip by who is going to mentor you and help you build your dream career? If you don’t join now how long are you going to wait before you really commit to being a successful, well paid personal trainer? Oh dear, you don’t read good huh?I’m promising to refund every penny you pay if you don’t make 10 times more than you spend. That means if you don’t bring in at least £500 of personal training income you get every penny back. I can’t say fairer than that.